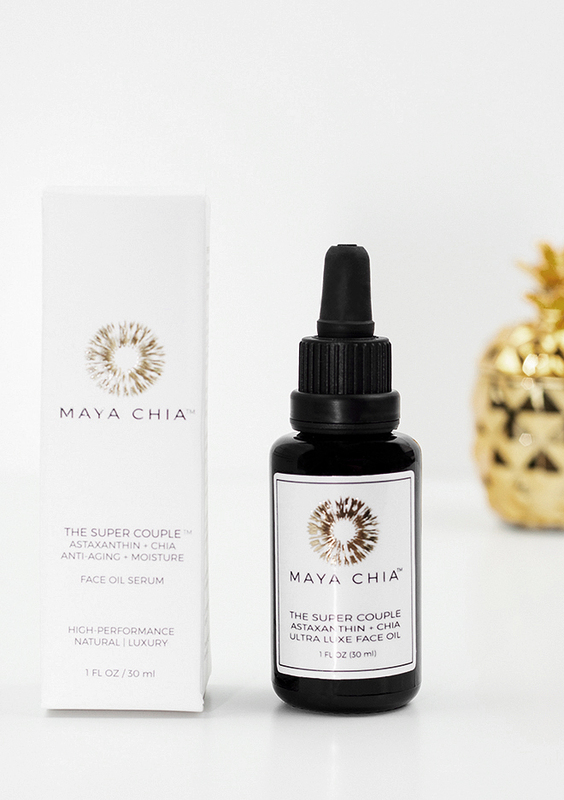 The latest addition to my skincare routine is this new Maya Chia The Super Couple Ultra Luxe Face Oil Serum* with #1 superfood: supercritical chia seed oil. Chia seed oil is one of my all time favorite oils together with tamanu oil and rosehip oil. I don’t know any other oils that are so obviously effective. It’s no wonder that chia is often called miraculous. 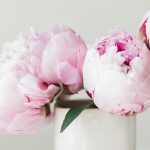 Besides the fact that some clinical studies have shown that topical application of chia seed oil results in skin moisture increase, this oil also gives glow and softness for the skin. The Super Couple Face Oil comes in a dark glass bottle with a dropper. The color of the oil is vivid orange, but though this might look a bit scary, it does not stain the skin at all. It’s a beauty oil with a gentle herbal scent and lightweight, non-greasy consistency, which makes it suitable for all skin types. Along with chia, there’s an ingredient called astaxanthin from green algae. I’ve never heard of astaxanthin before, but, apparently, it is a powerful antioxidant, which is effective in fighting free radicals even more than vitamin C or green tea. Supercritical Chia (Salvia Hispanica) Seed Oil, Haematococcus Pluvialis Algal (Astaxanthin) Extract, Jasminum Grandiflorum (Jasmine) Absolute, Rosa Damascena (Bulgarian Rose) Absolute, Santalum Spicatum (Australian Sandalwood), Aniba Roseodora (Rosewood) Essential Oil, Daucus Carota (Carrot) Seed Essential Oil, Lavandula Angustifolia (Lavender) Essential Oil, Cistus Ladaniferus (Cistus) Essential Oil, Boswellia Carterii (Frankincense) Essential Oil, Myrrha Commiphora (Myrrh) Essential Oil, Anthemis Nobilis (Roman Chamomile) Flower Essential Oil, Chamomilla Recutita (German Chamomile) Essential Oil. The reason why this review is going to be one of the shortest I’ve even written, because I can’t think of any disadvantages, regarding this serum. I’ve been using it for almost three weeks now and love it to bits because it makes my skin feel hydrated, soothed, and healthy. I can even understand its price, which is honestly not that low since high-performance luxury beauty products with quality ingredients don’t come cheap. 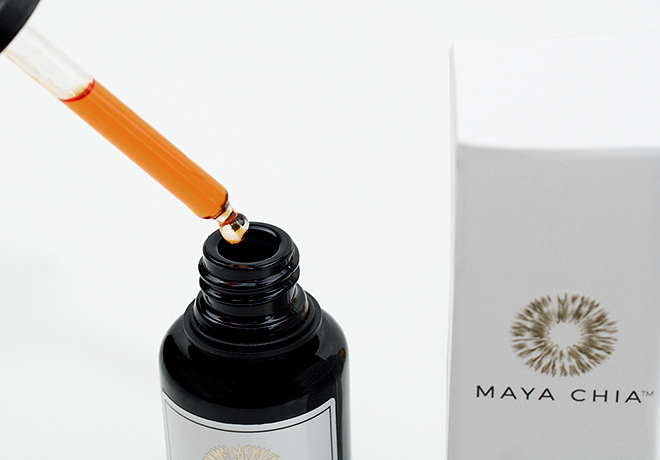 Maya Chia The Super Couple Ultra Luxe Face Oil Serum is available online at Maya Chia for $85 for 30ml. Currently, it’s only available in the US, but, hopefully, this will change shortly. 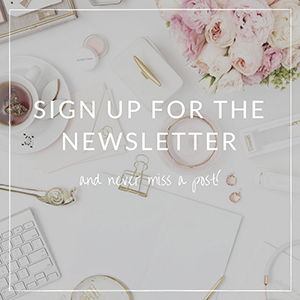 Do you like serums with chia seed oil? Have you tried Maya Chia? I love chia seed oil! I’ve been using Leahlani Skincare’s Mahina Night Elixir with prickly pear and chia seed oil!! Mmmmm so smoothing and nourishing. 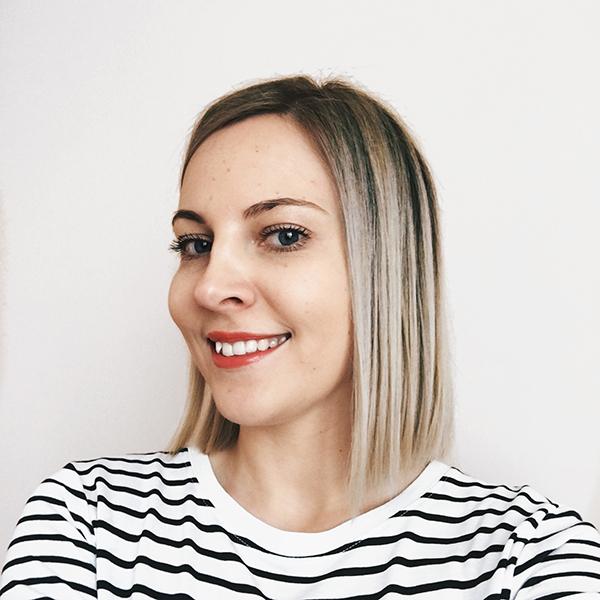 I read your review about a few of Leahlani products and you definitely got me interested! the color is outstanding! Chia seed is really having a hay day right now! I’ve been seeing pop up in a lot of things! I haven’t tried any of their other products, but that serum totally lives up to its hype.